Zion Market Research has published a new report titled “Combat System Integration Market by Platform (Large Combat Ships, Medium Combat Ships, Helicopters, Small Combat Ships, Submarines, Fighter Aircraft and Armored Vehicles/Artillery) Market for Naval, Airborne and Land-Based Applications: Global Industry Perspective, Comprehensive Analysis and Forecast, 2016 - 2022”. 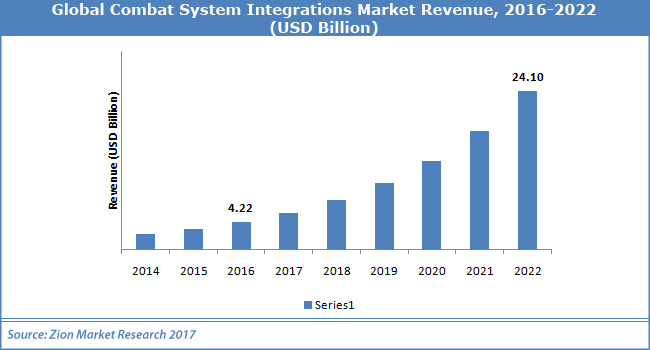 According to the report, the global combat system integration market accounted for USD 4.22 billion in 2016 and is expected to reach USD 24.10 billion by 2022, growing at a CAGR of around 33.7% between 2017 and 2022. A combat system can be viewed as a system for processing targets. In essence, each warfighting path constitutes a sequential process for end-to-end engagement of a target. Combat systems support both transformational and reactive operating processes, giving rise to the basic control hierarchy. Development of advanced combat systems for improved situational awareness markets of Europe and North America is anticipated to prompt the growth of combat system integration market in coming years. Growing need for networking unmanned systems coupled with ongoing military modernization and replenishment programs helps to further fuel demand for combat system integrations market in the analysis period. Rise in defense spending in developing economies, increasing incidences of armed conflicts & terror attacks and growing need for enhancement of performance of combat platform is predicted to flourish the growth of combat system integrations market in years to come. However, declining defense budget of advanced economies may pose a challenge for combat system integrations market in the forecast period. Even so, a massive R&D investment for technological advancements in defense operation is expected to open new alluring opportunities for combat system integrations market in near future. Submarine platform segment dominated the combat system integration market in 2016 owing to increasing use of military forces globally for diverse applications such as target acquisition, tracking, patrolling and surveillance. Fighter aircraft and armored vehicles/artillery are predicted to offer massive growth opportunities for combat system integration in the forecast period. Naval application segment held the largest market share in 2016, the growth of this segment is mainly attributed to increase in the number of navy combat system modernization programs paired with the rise in defense spending. Airborne and land-based application segment also likely to experience significant growth in coming years. With the largest share, Asia Pacific was a leading regional market for combat system integration in 2016 followed by North America. China is projected to lead the combat system integration market during the analysis period. The growth of the China combat system integration market can be attributed to rapid advancements taking place in its warfare systems and increased investments being made in armed forces. In North America, U.S. is expected to be a most attractive region for combat system integration market owing to increasing research & development activities undertaken for the development of advanced technology-based designs of combat systems. Rising demand for military application is expected to show considerable growth in Europe. The Middle East is expected to be one of the fastest growing regional markets for combat system integration in the coming years owing to need for improved integration of combat systems. Africa region is also expected to show massive growth owing to increasing spending on defense. Some of the key players in the combat system integration are Thales Group, Elbit Systems Ltd, DCS Corporation, ICI Services Corporation, Qinetiq Group, Lockheed Martin Corporation, Raytheon Company, BAE Systems, Saab AB and Leonardo-Finmeccanica amongst others.